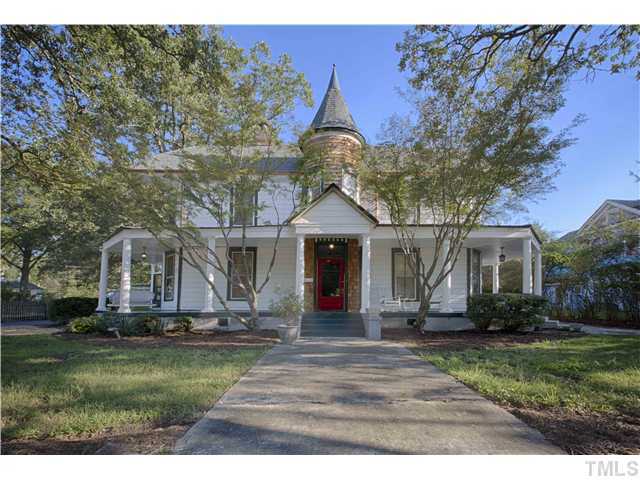 Constructed early in the 20th century by the Murray family, this two story, T-shaped house was long associated with its subsequent owners, the J.P. Whitley family. Another success! Growing up in Durham during the 1960's-1970's, this is one of the houses I recognized as a "usta-be-cool," and like the houses along Gregson, I felt this one too was permanently relegated to funky student housing for those with neither money or concerns about minimal standards of living (redundant?). You should have seen what these students hung outside their houses, what they drove, where (and how) they parked, what they wore, how they partied, the conditions of the yards...blah, blah, blah. (I went to college too, so this view dissipated as I realized what was up.) Anyway, the tower begged intrigue, the odd shapes and porch challenged my mid-century ranch familiarity, but the house was so down hill that its aluminum siding improved and modernized it to the better in my young and untrained mind. So - I thank the aluminum siding for time-capsuling the vessel. Is this the architectural version of cryonics? Thanks, Gary. Thank you for updating the site to show the house as it is now. I bought the house about 6 years ago and it looked so sad and droopy that I felt sorry for it. I always had a burning curiosity to know what architectural detail was under the aluminum siding. During the porch renovation, I had a peek at the hidden character and charm and I couldn't rest until I had uncovered it. I agree that the aluminum siding preserved the character, and I am thankful for that. Unfortunately, it stripped the house of its dignity while it was preserving it. 1919: Claud Johnson - "tobacco"
1928: George P Whitley - "North Durham Grocery"; Ray R Whitley - "Bookkeeper"
North Roxboro did not extend north of Trinity Avenue until 1958; at that time, the house at 117 East Trinity Avenue was demolished, and 203 East Trinity Ave. became a corner house. 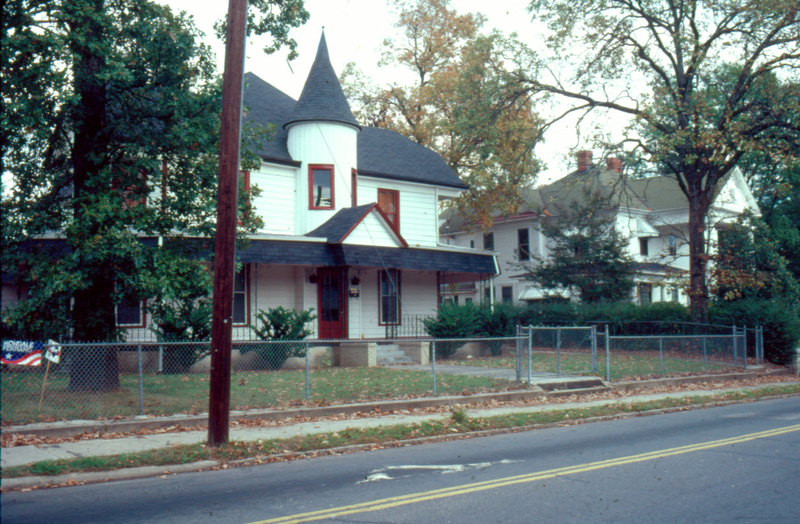 In the 1970s, the house was converted to a boarding house and the distinguishing Victorian features of the central tower with conical roof, three-sided end bays and clipped gable roofline were severely compromised by the application of aluminum siding. 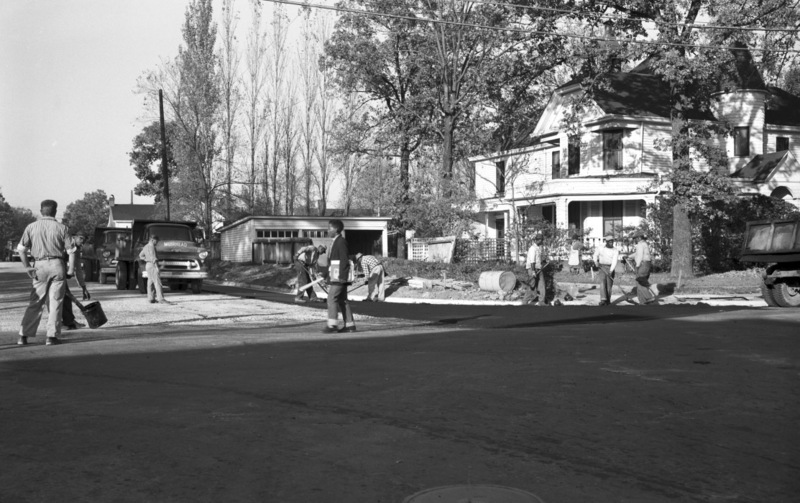 Richard Safran and Andrew Kagan purchased the house and began restoring it in 1981; Richard wrote me to share his wonderful recollections of his time living in and renovating 203 East Trinity. blew up. Eventually they approved the loan, paid the purchase price and put the balance into escrow which they disbursed a little at a time after inspecting the progress of construction." 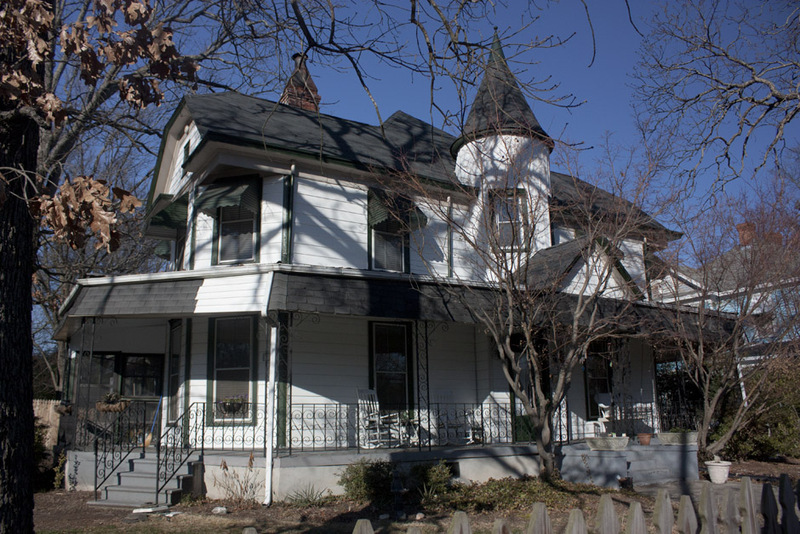 "We bought the house from a man who owned a funeral parlor in Durham and had purchased it with the idea of opening another location. I think he ran short of money, so instead he rented it out as an SRO to social service clients at $25 per room per week. Our purchase contract required that he deliver the house empty. The last residents left a few days before we closed, so we never had a chance to fully evaluate the interior before we took possession. The day we closed, we had a few friends over to celebrate. No one would go inside, so we had champagne on the porch." "As far as I remember, the house was originally built in 1910, probably by a J.S. Murray. I remember being told that it was originally a single-story structure, with the second floor added on at some later date. Whether that's true or not, I can't say." "The house has aluminum siding which I desperately wanted to remove so that the clapboards underneath could be visible, but that was way beyond our budget." "Once we had the freedom to go inside, we found a treasure trove. The ground floor with the wonderful 10 foot ceilings were covered with acoustical tile. Pulling that down we uncovered 2 layers of ceiling paper, faded almost to white. Under that was a layer of burlap. Under that was gorgeous beaded tongue-in-groove wood. I had never seen that in a ceiling. Unfortunately, the tiles had been stapled into the wood. The contractor tried to remove them, but most of them had to remain." 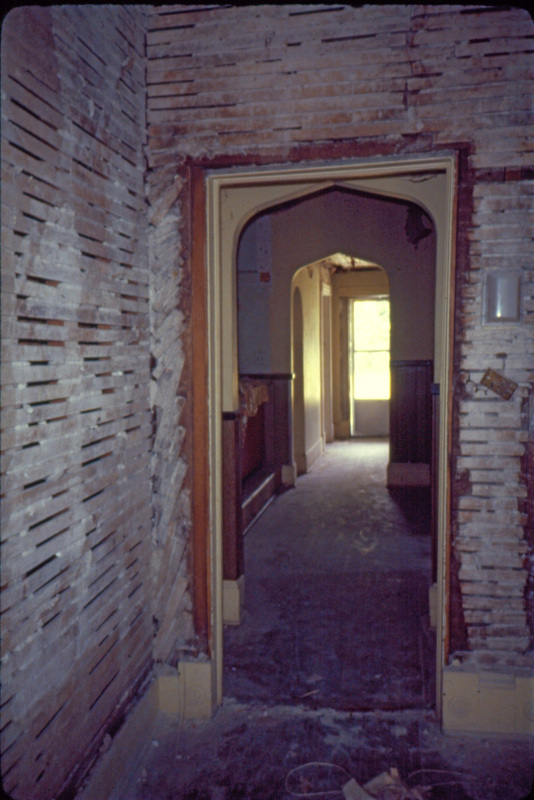 "In the central hallway, in the central third of the house was a 12 foot long wet bar. We could only imagine one possible use for a large wet bar in a large old house. Above the bar was a large window made of brick glass. We commissioned a local artist (sorry, name forgotten) to create a stained glass replacement. Behind the window was the separate entrance staircase for the second floor which had large windows and faced east. Mornings were wonderful when the sun came through the stained glass." "The second floor had multiple layers of cheap carpet. We pulled it up and found very dark wood floors with wide planks (as opposed to the typical narrow oak floors downstairs). When the floors were scraped and polyurethaned we found that the dark wood was heart pine which glowed red and yellow. Amazing. The second floor ceilings were also wood." "The porch had a tin roof which was in terrible shape. We managed to replace it with new tin." "Even with the loan from the bank, we were not in a position to afford the entire house. The second floor was made into a four bedroom apartment. There was already a kitchen upstairs which we improved. We rented it to four girls who were seniors at Duke. Naturally, the entire house wasn't finished by the start of the school year, so we had the contractor work exclusively on the upstairs so that the girls would have a finished space. Andrew and I were living amidst the construction downstairs and without a functioning kitchen." "The following year we rented to four members of the ATO (?) fraternity, including Mike Tissaw, the center for the basketball team. We had a shed in the back yard which was pretty much unused, and one of the tenants, a wrestler, was in a band. We made a deal that if they soundproofed the shed (they found a lot of used mattresses), they could use the shed to rehearse, with the added proviso that they had to play at our parties. The parties became huge affairs, especially the Halloween party. With the athletes, kegs and a band, we were a magnet for a LOT of students, at least those willing to leave campus, as well as our friends and neighbors. The police knew our location pretty well after a while." "I left Durham around 1983. Andrew stayed on in the house for quite a while."